Certificates are created from a Certificate Template. If the available Certificate Templates do not meet your needs, you can create a new Certificate Template from a current Certificate Template. In the left panel, expand your root server, right-click on Certificate Templates and select Manage. Right-click on one of the current certificate templates and select Duplicate Template. On the General tab, give the template a unique name. 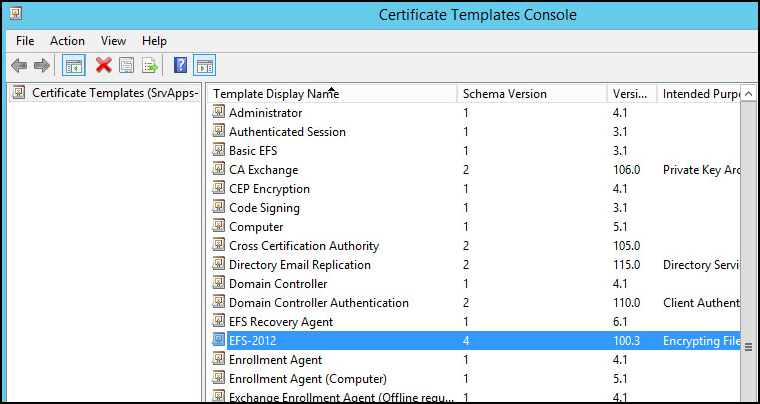 The new certificate template should be displayed (EFS-2012 in this example). In the left panel, right-click on Certification Templates and select New > Certificate Template to Issue. Select the certificate template you would like to use and select OK.